Oddly dnough that is a point I agreed with 10 posts ago. Don't blame me for your dumb rant on an invalid comparison, the comparison was the only point I was making. That is ridiculous not to have that in at launch. The MP will be DOA. I’m sure there will be a small amount that do not mind playing solo. The large portion of people that play MP will laugh at not being able to party up with friends and move on. Give them a break. I mean it's not like they've had nearly 8 years to develop this. Multiplayer definitely seems half baked for sure. I'm only interested in SP anyway, but they shouldn't put multiplayer in there at all if it doesn't have basic functionality. Yet again, good communication is important. Don't tell people there will be MP and not have simple functionality. Just say the MP isn't ready for launch and coming at a later date. I'd say there was very little appetite to formally announce anymore delays with this even if it's about functionality that is to be added. Don't delay the game, just the MP. It is better than the alternative. 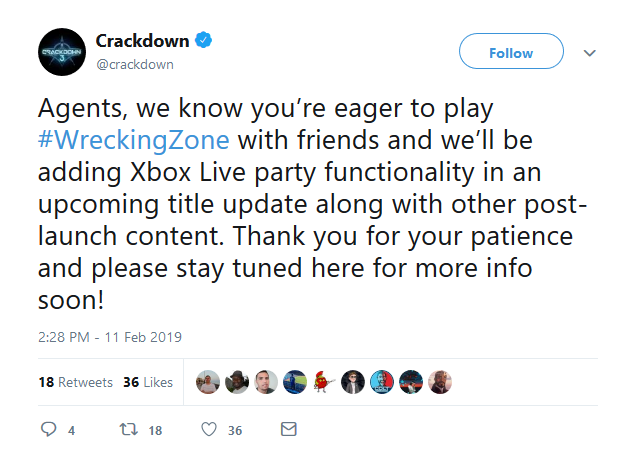 I can already see my Youtube front page on Friday "broken Crackdown 3 MP!!!!". The gaming community can be silly sometimes, but you know they are going to freak out. Being up front and honest about things is always the least bad option. 95% of gamers don't read places like this and won't have a clue. Doesn't make a difference. Delaying the MP will have the same result. The MP in this is doomed anyway. Between the dev time and online hyping this game will get ripped apart. I can already see the Kotaku article, "entitled gamers outrage over multiplayer." Many of us get it on Game Pass so many of us will try it on Friday and you should have a good number of opinions from people once we've actually played the game. If you like tearing things down, this game is unparalleled. Not played or watched the mp much, might there be a gameplay reason for it not being included? I'm not sure it matters as much as the rendering, but needing to be rendered centrally in order for that dynamic, moving environment to be the same at every frame for everyone. If you render physics locally there could be variation in where debris lands, thus rendering it useless for a shared scenario where you can use it for cover, or traversal. This is why you would bake destruction or make debris disappear. Yeah but again that kind of thing has been done baked before, does the end user really know the difference? Horny for asses belongs in a wholly different thread, sir. And yes, I am. So this game is finally coming out huh?? It’s the Xbox’s The Last Guardian. Even if it is free with Game Pass I won't pollute my Xbox' s harddrive with this B game. It's clear they couldn't actually produce what they advertised early on, the tech demo was so much more than what they were actually able to achieve with real gameplay. The destruction was downgraded in just about every way possible, the quality of the destruction and the scale has been toned way down, it's small maps now vs what the guy said they could do in the video which was talking about being able to destroy every building you could see even a mile away etc. I kind of want to blame it on it being handled by lackluster studios but they still had access to MS's engineers and 5 years of development time. Demo was by a different team who was trying to sell their tech. They sold it to Epic. Microsoft kept none of it and started over. What I’m curious about is what kind of deal did Microsoft have that they funded someone else's science project and that company took the tech somewhere else without Microsoft getting to keep anything from the relationship. Sign of incompetent management at the time. Not incompetent engineers. Doesn’t seem like they brought the tech in house. This is a must know. If you can't party up for co op then I won't even bother. 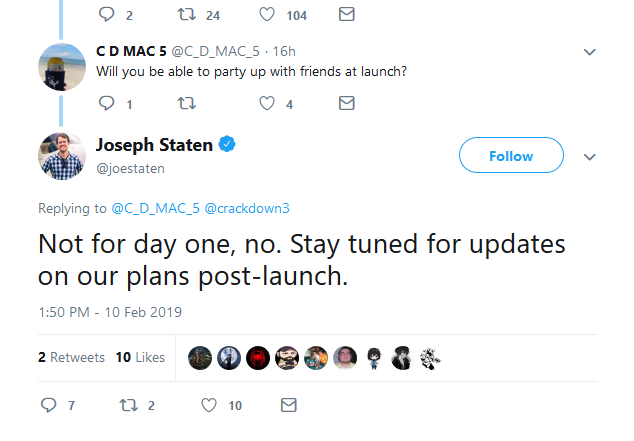 I have a feeling that all partying will be done in a post-launch update. Yeah, the footage with no shadows are typically from PC with shadows turned off - no idea why though. Xbox One clips typically have shadows.